James Van Ostrand is no stranger to the international stage. On Tuesday, it was his turn to take the spotlight. The Astros farmhand drove in both of Canada's runs in the gold medal-clinching 2-1 victory over Team USA at the Pan Am Games. It was Canada's first gold at a major tourney, and the fourth consecutive Pan Am silver for the United States. Chris Robinson (Cubs) and Tim Smith (Royals) hit back-to-back singles with two outs in the sixth inning to start the rally for Canada. Van Ostrand lined a 1-1 pitch from Andy Van Hekken (Astros) down the right-field line, allowing Robinson and Smith to score to give Canada its first lead of the game. Van Ostrand, an eighth-round pick by the Astros in 2006, had a solid season for Double-A Corpus Christi, batting .306 with 11 homers and 46 RBIs in 104 games for the Hooks. 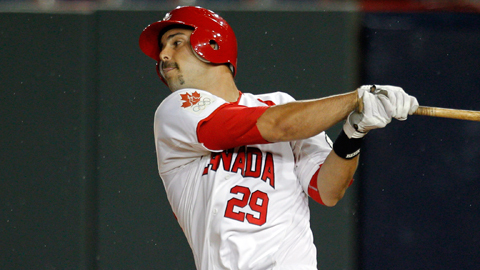 The 27-year-old first baseman has represented Canada before, playing in the 2007 Futures Game. In 2010, he carried the Olympic torch through his hometown of Richmond, British Columbia. Twins prospect Andrew Albers allowed a run on six hits and fanned eight over 6 1/3 innings for Canada to earn the win. Scott Richmond (Blue Jays) retired the final seven Americans in order to close out the game. Van Hekken, who pitched in 35 games for Oklahoma City, took the loss, surrendering two runs on six hits and struck out six over seven innings. It was the first loss in international play for the 32-year-old left-hander. Brett Carroll drove in the Americans' lone run with an RBI double and led the squad in the Pan Ams with a .556 average (10-for-18). Joe Thurston (Marlins), who went 1-for-4, recorded at least one hit in all 16 games he played for Team USA this season.